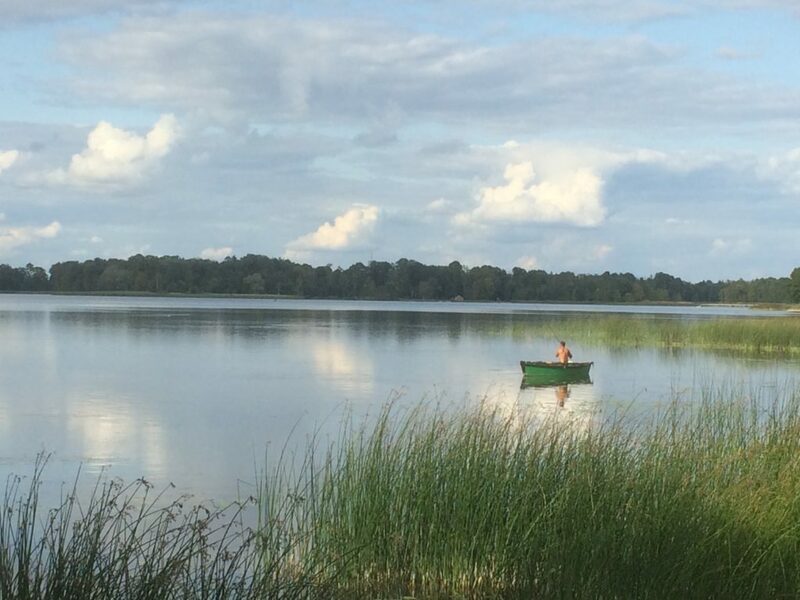 In August, NCW’s associate programme director Kate Griffin travelled to Lithuania for the Nordic Summer festival in Biržai. On our first evening in Vilnius, my husband Fairless and I walked through the tourist-filled streets of the city with the Latvian translator Dāce Meiere on our way to the Library of Beer, which was as good as it sounds. This book-themed bar would be hard to find without someone who knows where they’re going, located as it is in a quiet street up a flight of stairs. On the way back to our hotel, we took a different route, through the old Jewish district, past the museum and community centre, talking about Lithuania’s difficult history. We have our own difficult history, of slavery, colonialism and empire, but our atrocities took place outside the UK, so they’re easier for us to overlook. My reading matter on the journey from Norwich to Vilnius had already set the mood for this first visit to Lithuania. 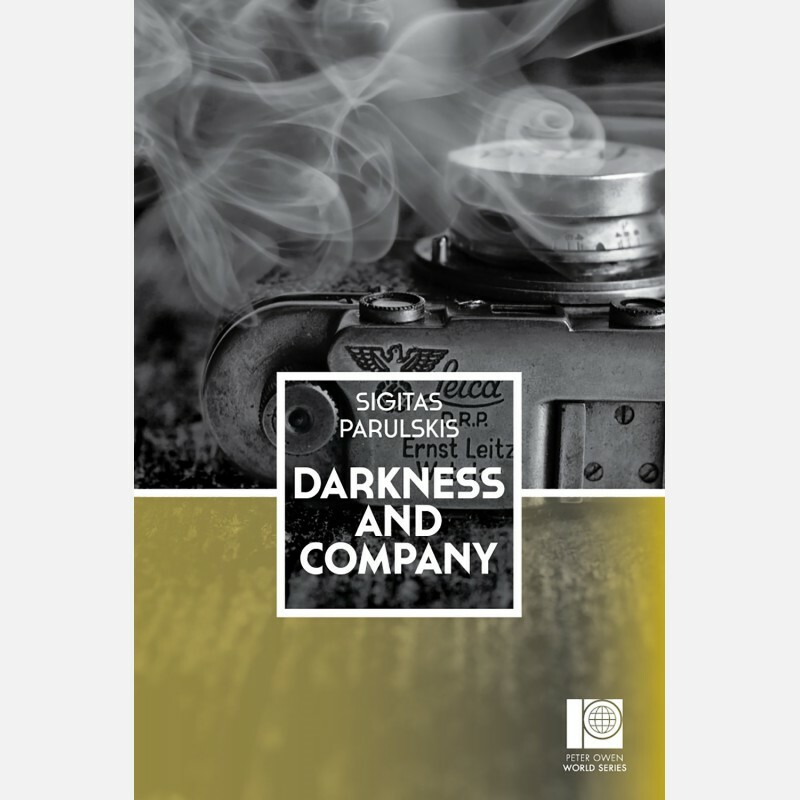 I’d chosen Sigitas Parulskis’s Darkness and Company, published by Peter Owen. Sigitas came to Worlds in Norwich in 2015 and spoke to us about why he wrote this bleak and disturbing novel. Parulskis grew up in Obeliai, a small town in Lithuania. As a child, he would play in the Jewish cemetery on the outskirts of the town: ‘Headstones decorated with large, incomprehensible, angular marks stood there, crooked, frozen in a variety of poses.’ However, it was only when he was in the Imperial War Museum in London that he was shocked into acknowledging the history of his town, the site of a massacre of 1,160 Jews by the Nazis and local collaborators. During World War Two, the Nazis and Lithuanian collaborators killed almost the entire Jewish population of Lithuania. Very few contemporary novelists in Lithuania have written about the subject, but Sigitas decided to address this taboo. Darkness and Company is written from the perspective of a Lithuanian photographer, Vincentas, who is coerced into taking artistic pictures of the mass killings for a somewhat perverted German officer; in return, the officer will protect Vincentas’s Jewish lover Judita from the death squads. It’s a painful exploration of the difference – if any – between observing and being complicit in such crimes. On the three-hour bus trip from Vilnius to Biržai, a small town in the north, near the border with Latvia, Fairless and I did our research, reading a brief overview of the extremely complicated history of the country and its relationship with its neighbours, Poland and Russia. Lithuania gained independence in 1918, but during the Second World War it fell under German and then Soviet control, only regaining its independence in 1990. We were headed for the Nordic Summer festival organised by Giedra Radvilavičiūtė and Rūta Elijošaitytė-Kaikarė that this year celebrated the centenary of independence, with a focus on writers and the state. The festival took place in Biržai Castle, reconstructed from ruins in 1978. Biržai is also known for its large artificial lake, ideal for swimming and floating around looking at the clouds, and its nearby brewery producing fine real ales. The people of Biržai seem to welcome the festival’s annual visit to their hometown; in particular, the deputy mayor spoke approvingly of the homemade jam auction run by Alvydas Šlepikas, who was the Lithuanian writer in residence at the BCLT Summer School in 2017. This year the auction raised 219 euros to buy books for disadvantaged families in the region. Over the weekend there were a number of presentations by writers, critics and historians exploring various aspects of Lithuanian history from a literary perspective. On the opening evening, the poet Rimvydas Stankevičius talked about his experience of growing up in Soviet times with rebellious grandparents who secretly taught him the Lithuanian anthem. His uncle told him tales about the Forest Brothers, partisans who continued fighting for Lithuanian independence after World War Two, while the local priest slipped him partisan literature to read. Only 17 when Lithuania regained independence in 1990, Stankevičius spoke of the excitement of those days, recalling the Polish-Lithuanian poet Czeslaw Milosz who said that a good poet should be a witness to such times for other generations. Our interpreter lost heart when Stankevičius started reciting poems, so I retired to the balcony and read some English translations of his poetry in the Vilnius Review. The next morning started with a discussion of history and literature, which the historian Aurimas Svedas described as identical twins, transforming the path of history into literary form. He talked about how literary texts close the gap between the past and the present by evoking the feeling of the past, bringing it to life and turning it into something we can understand. Writers can produce literature about difficult and traumatic aspects of history, whereas historians may be constrained by the ideology of their times. History untold is non-existent history. During his presentation, Svedas referred to Silva Rerum, a blockbuster series of historical novels by Lithuania’s answer to Hilary Mantel, the writer Kristina Sabaliauskaitė. One of her novels, which popularised the Baroque era in Lithuania, is set in Biržai Castle, but unfortunately is not yet translated into English. Other topics included Ričardas Gavelis, author of Vilnius Poker, published in English by Open Letter Books, a writer remembered mostly for his novels criticising Soviet times through irony and satire; the theme of death in the poetry of Tomas Venclova; the destruction of buildings as part of the westernisation of Vilnius and the resulting loss of historical memory; Lithuanian society’s attitude to war between 1918 and 1940 and the never-ending requisitions of civilians’ land and resources in the lead-up to the Second World War; and Mission Siberia, a project to commemorate the deportation of over 300,000 Lithuanians to Siberia by the Soviet regime. Each year a group of young Lithuanians travel to Siberia to visit and tend Lithuanians’ graves, and meet with survivors and their descendants. Although there is a move to bring back the remains of deportees to Lithuania, their aim is to keep alive the memories of Lithuanians’ lives in the places where they lived in Siberia. This theme of commemoration is an important part of There and Not There, a film shown at the festival by Lithuanian artist Paulina Pukytė about the 11th Biennale, which she curated in Lithuania’s second largest city, Kaunas. She told us that the biennale opposed the populist practice of removing old monuments and replacing them with new ones that fit the current ideology. Instead, Pukytė asked artists to stimulate new forms of commemoration by imagining future monuments. In the film it was noticeable that many of these monuments marked Jewish massacres that were otherwise uncommemorated. A number of the future monuments were located in Democrats Square, the site of the Kaunas ghetto from 1941 to 1944. Every day during the biennale, a singer stood in the empty square singing Yiddish songs. Shoppers in a small supermarket on the edge of the square found themselves using bags marked either ‘to the left’ or ‘to the right’. These plastic bags commemorated 28th October 1942, when 30,000 Jews were lined up and sent to one side or the other. Those sent to the right went home that night; the 9,200 people on the left were shot. A Murmuration was a video installation in an abandoned building that was once a Hassidic Jewish Synagogue, last used in 1940. Today the Jewish population of Kaunas is less than 500: a Murmuration is an evocation of that absence. On our last morning in Biržai, Fairless and I visited the Jewish cemetery. We walked through quiet streets of small houses boasting impressive woodpiles, with gardens full of vegetables, tomatoes escaping from greenhouses, trees weighed down with apples and pears, and elderberry bushes laden with fruit. We found the Jewish cemetery in a wooded area on a small peninsula on the edge of town, by the lake. The old stones stood at all angles, rough, chipped, the Yiddish inscriptions covered in moss. Near the entrance were more modern stones, a little more orderly. Although the Jewish cemetery is marked on the map, I found nothing in the Birzai tourist leaflets about the Jewish presence in Biržai, so I looked on the internet. According to the Jewish Virtual Library, Jews started to settle in Biržai in the seventeenth century, and by the turn of the 20th century they constituted over 50% of the population. In 1915 the Jews were expelled by the Russian military authorities, but in the period after independence the Jewish community grew again until by the mid-1930s they formed 36% of the population, around 3,000 people. Three of the twelve city councillors were Jewish and there were Hebrew and Yiddish schools and a talmud torah. Most Jews earned their living from trade in wood and flax; some families owned factories for weaving and spinning. After the German occupation in 1940 a ghetto was established. The 30 Jews were shot in the Jewish cemetery in July 1941, then on 8th August 1941, Lithuanian nationalists executed 500 Jewish men. The remaining 2,400 or so people were shot in a mass grave in the forest around three kilometres from the town. When Dāce Meiere commented on Facebook on this apparent historical amnesia by the tourism authorities in Biržai, a friend sent her the link to Jews on the Map of Lithuania: the Case of Biržai. Preserving Jewish Heritage and Historical Memory, which showed us that our impression was completely wrong. This study, published in Moscow in 2015, demonstrates the growing interest towards Jewish cultural and historical heritage in Biržai, where Rabbinical Jews and Karaite lived as neighbours.